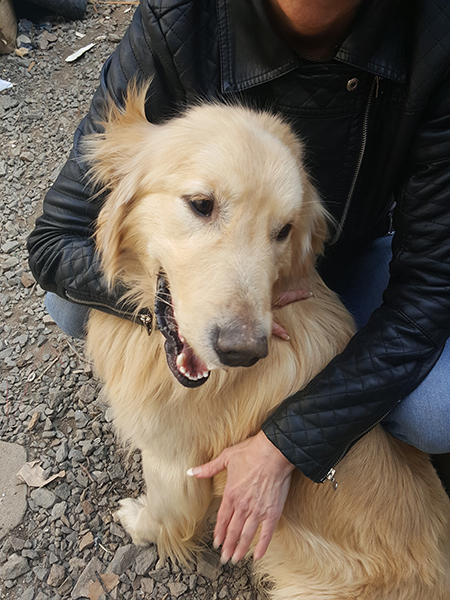 Adami is a one-year-old Golden Retriever living with a foster family in Ladera Ranch, CA after being transported by SCGRR from Korea to SoCal. He is being treated for a severe case of heartworm disease which if not treated properly will result in death. Adami’s treatment requires that he be contained, which is not easy for a playful one-year old pup, but it sure beats what was in store for him in his native Korea. Adami was purchased from a dog meat market while still in one piece by a South Korean animal rights activist. Through mutual friends, she came into contact with Barbara Gale of Southern California Golden Retriever Rescue (SCGRR) and before long Adami was on his way to Los Angeles rather than the dinner table. The Tess McIntyre Foundation recently made a $2,000 donation to SCGRR to help defray the cost of Adami’s heartworm treatment and hospital stay. The Foundation is seeking additional donations (http://www.tessmcintyrefoundation.org/) to provide further assistance as Adami proceeds along the path to recovery and adoption, and to help other dogs in need of medical assistance so they can become adopted. Upon his arrival in the U.S. on April 18, Adami was neutered and treated at the Animal Medical Center (AMC) in Los Angeles. He remained there until early May when he was released to his current foster home. His initial 60-day treatment involved two injections of Immiticide. The veterinary staff at AMC will then determine if a third injection is necessary. SCGRR has been working to rescue dogs not only from Korea, but from China and Taiwan as well. According to the Korea Animal Rights Activists (KARA), some 2.5 million dogs are slaughtered each year in that country. We needed to get at least one out and into care. The Tess McIntyre Foundation was founded last year. It is named after Tess, a three-year-old Golden Retriever who was adopted from SCGRR. Tess was killed in an accident not long after moving into her new home. Her owners have dedicated their efforts in her memory to helping other rescued dogs. One of the primary goals of the Foundation is to support dogs that need medical care before they can be put up for adoption.